The increasing emergence of carbapenem-resistant Acinetobacter calcoaceticus-baumannii complex (ACB complex) in Taiwan was noted. According to the Taiwan Surveillance of Antimicrobial Resistance, the prevalence of carbapenem-resistant ACB complex increased from 3.4% in 2002 to 58.7% in 2010., Patients infected by this organism are difficult to treat because of the limited therapeutic options. Many studies in Taiwan regarding the molecular and clinical epidemiology of carbapenem-resistant ACB complex have been reported before.,,,, However, such studies were mostly conducted in a single or a multicentered hospital setting. The application of such research results for relatively smaller scale hospitals was questionable since the patient population and hospital environment were different. Rare epidemiological studies of carbapenem-resistant ACB complex conducted in a regional or district hospital have been reported., Therefore, we initiated this study to identify risk factors and describe molecular epidemiology of carbapenem-resistant ACB complex at a district teaching hospital located in the Penghu islands, Taiwan. This investigation was a retrospective case–control study. The study procedures were reviewed and approved by the institutional. The study period was from May 2014 to June 2016, and the approval for the study was obtained from the Institutional Review Board (TSGHIRB, 1-103-05-100). The sample included all hospitalized patients aged 18 or older with ACB complex isolated from clinical specimen during the study period. Patients with ACB complex isolates who were younger than 18 years of age or nonadmitted were excluded from the study. Patients included for the study were separated into two groups. The case group comprised patients who were infected or colonized with carbapenem-resistant ACB complex confirmed by the results of the laboratory database. The control group was composed of patients who acquired an ACB complex that is not resistant to imipenem or meropenem. The study was conducted at the district teaching hospital in Penghu, Taiwan, with 210 general ward beds and 10 Intensive Care Unit (ICU) beds. It provides acute medical and surgical services to the residents of the Penghu Islands, with an average of 200 admissions per month. 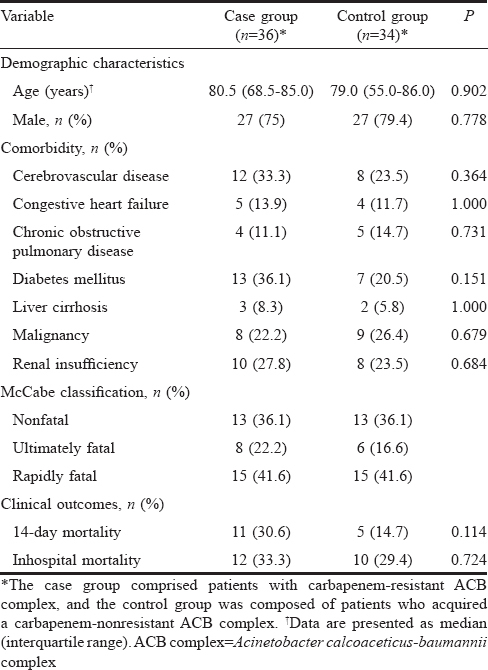 The clinical data of identified patients in both groups were recorded through medical chart review: demographic characteristics, comorbidities, severity of the underlying disease according to the McCabe and Jackson classification, exposure to antimicrobial agents 2 weeks before ACB complex isolation, indwelling devices, and clinical outcomes. ACB complex isolates from the clinical specimen of identified patients were verified with the VITEK 2 automated system (bioMérieux Inc., Marcy-l'Etoile, Rhône, France). ACB complex included A. calcoaceticus, A. baumannii, Acinetobacter genomic species 3, and 13TU, which were phenotypically indistinguishable using a routine laboratory identification method. Susceptibility of ACB complex isolates was measured by the VITEK 2 automatic system using an automated broth microdilution method. According to the guidelines from the 2016 Clinical and Laboratory Standards Institute, carbapenem-resistant ACB complex is an isolate resistant to imipenem or meropenem defined as the minimal inhibitory concentration ≥8 μg/mL. The susceptibility of identified carbapenem-resistant ACB complex isolates to other antimicrobial agents was also recorded. The British Society for Antimicrobial Chemotherapy tigecycline breakpoints were used as the interpretative criteria. The clonal relationship of available carbapenem-resistant ACB complex isolates was analyzed by a pulsed-field gel electrophoresis (PFGE) using the restriction enzyme ApaI (New England Biolabs, Ipswich, MA, USA). The banding patterns of PFGE were analyzed with BioNumerics software (Applied Maths, Kortrijk, Belgium) using the Dice coefficient similarity index and unweighted pair group method. PFGE patterns were compared and analyzed according to Tenover et al. Strains with PFGE profiles of more than 80% were considered closely related. The results were analyzed using a commercially available software package (SPSS, version 16.0; SPSS Inc., Chicago, IL, USA). The categorical variables were analyzed using Chi-square or Fisher's exact test as appropriate. Continuous variables were compared using Mann–Whitney test. A multivariable analysis was performed using a logistic regression to identify the independent risk factors associated with the isolation of the carbapenem-resistant ACB complex. Variables with P < 0.1 on bivariable analysis were considered for inclusion in a multivariable analysis. All P values were two-tailed, and P < 0.05 was considered as statistically significant. From May 2014 to June 2016, the annual incidence of colonization or infection due to carbapenem-resistant ACB complex per 1000 discharges was 2.8, 3.5, and 2.2 in 2014, 2015, and 2016, respectively. During the study period, 36 patients at our institution had carbapenem-resistant ACB complex and 34 had carbapenem-nonresistant ACB complex. 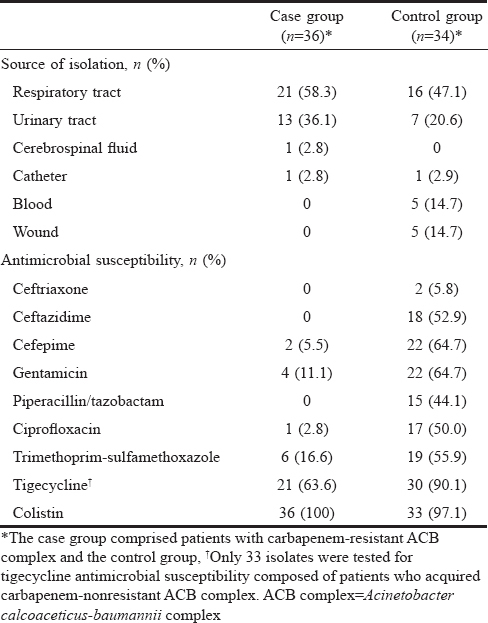 [Table 1] summarized the clinical characteristics of identified patients and controls with carbapenem-resistant ACB complex and carbapenem-nonresistant ACB complex, respectively. Demographic features, disease severity, comorbidities, and clinical outcomes (14-day and inhospital mortality) were similar in both groups. The bivariate analysis was shown in [Table 2]. Patients in the carbapenem-resistant ACB complex group had a higher rate of recent admission within 3 months and insertion of indwelling nasogastric tubes as compared with those in the nonresistant complex group, but these differences did not reach significance (P = 0.066 and 0.0051, respectively). Of the antimicrobials previously exposed, fluoroquinolone was the only class that showed a significant difference between groups (22.2% and 2.9%, P = 0.028). In the multivariable analysis shown in [Table 3], previous fluoroquinolone exposure was independently associated with the presence of ACB complex (odds ratio = 10.477, P = 0.040). 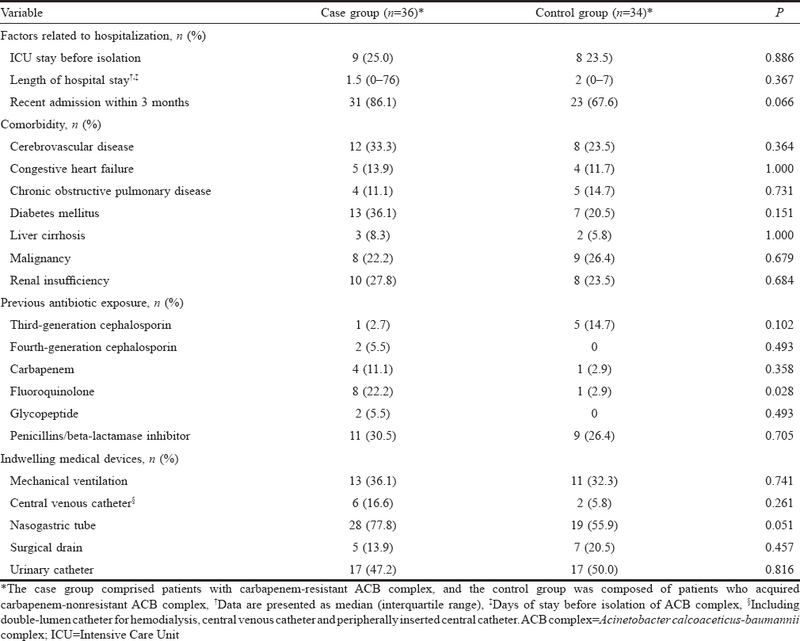 The microbiology of carbapenem-resistant ACB complex isolates was shown in [Table 4]. The most common isolation region was from the respiratory tract. Carbapenem-resistant ACB complex isolates were resistant to multiple antibiotics, and colistin was the only agent with an excellent activity against these isolates. Seven of the 36 carbapenem-resistant ACB complex isolates from respiratory tract were available and used for molecular typing as shown in [Figure 1]. Of the seven isolates, one isolate belonged to pulsotype A; one isolate belonged to pulsotype B; four isolates belonged to pulsotype C, which was further subdivided into two subtypes (C1 and C2); and one isolate belonged to pulsotype D.
In this study, we described the risk factor and molecular epidemiology of carbapenem-resistant ACB complex in our hospital using a case–control study and a PFGE method. According to this study, previous fluoroquinolone use is a risk factor associated with the isolation of carbapenem-resistant ACB complex. Interpatient transmission further contributed to the dissemination of carbapenem-resistant ACB complex. Previous studies on carbapenem-resistant ACB complex in Taiwan reported that the risk factors associated with the isolation of carbapenem-resistant ACB complex were carbapenem use, duration of hospital stay, and admission in ICU.,, The current study revealed that previous fluoroquinolone use is the only factor associated with the isolation of carbapenem-resistant ACB complex. This difference in the results is attributed to the different clinical settings in the district hospital as compared with the medical centers or regional hospitals in Taiwan. In the district hospital, the decreased severity of disease in inpatients resulted in a short hospital stay, lower rates of ICU admissions, and decreased carbapenem use. As described earlier, previous exposure to fluoroquinolone was a risk factor associated with the isolation of carbapenem-resistant ACB complex., This result indicated the selective pressure of antibiotic remained responsible for the occurrence of carbapenem-resistant ACB complex in district hospitals. According to this study, epidemiological data of multiple drug-resistant organisms among different hospital levels may be varied, and measures to control multiple drug-resistant organisms spreading in Taiwan should be individualized according to local epidemiologic data to become cost-effective. The PFGE findings in this study revealed the evidence of clonal dissemination between patients in the hospital. Specifically, an outbreak occurred from May 2014 to October 2014 in the medical wards caused by carbapenem-resistant ACB complex. After the investigation, results revealed that the outbreak was related to poor adherence to hand hygiene among bedside caregivers, which has been reported earlier. In addition to our results, intrahospital and interhospital clonal dissemination among different levels of hospitals in Taiwan have been reported.,,, This worrisome phenomenon was attributed to the frequent patient transfers to the different levels of hospitals in Taiwan and poor adherence to hand hygiene among health-care workers. To control the clonal dissemination of carbapenem-resistant ACB complex in Taiwan, patients with carbapenem-resistant ACB complex were informed before transferring them to other hospitals, and strict adherence to hand hygiene among health-care workers was emphasized. This study had several limitations. First, the relatively small sample size and retrospective case–control design may possibly subject to selection bias and recall bias. In addition, causal relation also could not verified. Therefore, the results must be carefully interpreted. Second, the identification system used in our hospital was unable to identify the difference among ACB complex isolates, and the difference between species may bias our analysis. Third, this study was conducted in a district hospital in the outlying islands of Taiwan; thus, our findings were not generalizable to other hospitals of the same level in Taiwan. Therefore, future prospective study of multihospital of district level may be helpful for validating our results. We first described the epidemiology of carbapenem-resistant ACB complex in the district hospitals in Taiwan. Results show that cautious fluoroquinolone use and strict adherence to hand hygiene among health-care workers are critical to halt the emergence of carbapenem-resistant ACB complex. Supported by grants from the Tri-Service General Hospital, National Defense Medical Center (TSGH-C105-182), Taiwan. Kuo SC, Chang SC, Wang HY, Lai JF, Chen PC, Shiau YR, et al. Emergence of extensively drug-resistant Acinetobacter baumannii complex over 10 years: Nationwide data from the Taiwan surveillance of antimicrobial resistance (TSAR) program. BMC Infect Dis 2012;12:200. Hsieh WS, Wang NY, Feng JA, Weng LC, Wu HH. Types and prevalence of carbapenem-resistant Acinetobacter calcoaceticus-Acinetobacter baumannii complex in Northern Taiwan. Antimicrob Agents Chemother 2014;58:201-4. Kuo SC, Yang SP, Lee YT, Chuang HC, Chen CP, Chang CL, et al. Dissemination of imipenem-resistant Acinetobacter baumannii with new plasmid-borne bla(OXA-72) in Taiwan. BMC Infect Dis 2013;13:319. Siegel JD, Rhinehart E, Jackson M, Chiarello L; Healthcare Infection Control Practices Advisory Committee. Management of multidrug-resistant organisms in health care settings, 2006. Am J Infect Control 2007;35:S165-93. Lin MF, Yang CM, Lin CH, Huang ML, Tu CC, Liou ML, et al. Clinical features and molecular epidemiology of multidrug-resistant Acinetobacter calcoaceticus-A Baumannii complex in a regional teaching hospital in Taiwan. Am J Infect Control 2009;37:e1-3. Chen CM, Liu PY, Ke SC, Wu HJ, Wu LT. Investigation of carbapenem-resistant Acinetobacter baumannii isolates in a district hospital in Taiwan. Diagn Microbiol Infect Dis 2009;63:394-7. McCabe WR, Jackson GG. Gram-negative bacteremia I. Etiology and ecology. Arch Intern Med 1962;110:847-55. Clinical and Laboratory Standards Institute. Performance Standards for Antimicrobial Susceptibility Testing Tisew. PA: Clinical and Laboratory Standards Institute; 2016. Hope R, Parsons T, Mushtaq S, James D, Livermore DM. Determination of disc breakpoints and evaluation of etests for tigecycline susceptibility testing by the BSAC method. J Antimicrob Chemother 2007;60:770-4. Tenover FC, Arbeit RD, Goering RV, Mickelsen PA, Murray BE, Persing DH, et al. Interpreting chromosomal DNA restriction patterns produced by pulsed-field gel electrophoresis: Criteria for bacterial strain typing. J Clin Microbiol 1995;33:2233-9. Sheng WH, Liao CH, Lauderdale TL, Ko WC, Chen YS, Liu JW, et al. A multicenter study of risk factors and outcome of hospitalized patients with infections due to carbapenem-resistant Acinetobacter baumannii. Int J Infect Dis 2010;14:e764-9. Cheng VC, Chen JH, So SY, Wong SC, Yan MK, Chau PH, et al. Use of fluoroquinolones is the single most important risk factor for the high bacterial load in patients with nasal and gastrointestinal colonization by multidrug-resistant Acinetobacter baumannii. Eur J Clin Microbiol Infect Dis 2015;34:2359-66. Tan CK, Tang HJ, Lai CC, Chen YY, Chang PC, Liu WL, et al. Correlation between antibiotic consumption and carbapenem-resistant Acinetobacter baumannii causing health care-associated infections at a hospital from 2005 to 2010. J Microbiol Immunol Infect 2015;48:540-4. Wang CH, Li JF, Huang LY, Lin FM, Yang YS, Siu LK, et al. Outbreak of imipenem-resistant Acinetobacter baumannii in different wards at a regional hospital related to untrained bedside caregivers. Am J Infect Control 2017;45:1086-90. Chen TL, Lee YT, Kuo SC, Hsueh PR, Chang FY, Siu LK, et al. Emergence and distribution of plasmids bearing the blaOXA-51-like gene with an upstream ISAba1 in carbapenem-resistant Acinetobacter baumannii isolates in Taiwan. Antimicrob Agents Chemother 2010;54:4575-81. Zhang HZ, Zhang JS, Qiao L. The Acinetobacter baumannii group: A systemic review. World J Emerg Med 2013;4:169-74.